Every once in a while I want to create some quick Christmas cards and using Washi Tape and punched shapes, in this case stars, is the perfect answer. Today's card uses some Washi tape from the Pop of Pink Designer Washi Tape by Stampin' Up!® combined with some older Christmas Washi from my stash. 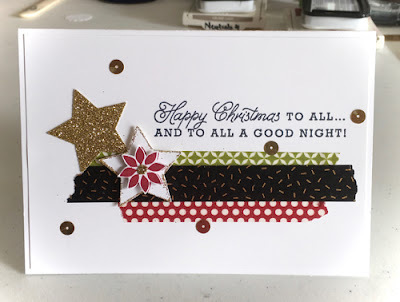 I wanted the lovely gold flecks to compliment the Gold Glimmer star that has been punched out with the Medium Star Punch, the centre of the Poinsettia and the gold sequins. Simply tear the ends of the Washi to get the uneven finish and apply it onto the card front. The layout of this card is quite versatile and can be used for a number of different occasions - all you need to do is change the stars for different motifs, and choose different Washi. I raised the Poinsettia on a dimensional and added a spot of Fine Tip Glue to the centre. I sprinkled some gold glitter on the glue . 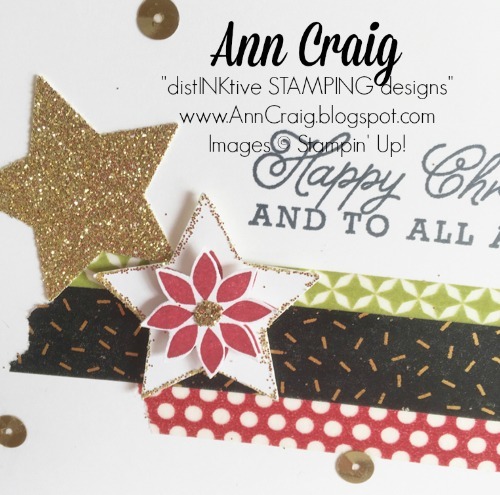 The edges of the star also have gold glitter applied - this time I used the 2-Way glue Pen. The greeting is from the Stampin' Up! stamp set - Greetings From Santa. It can be found on page 11 of the Holiday Catalogue. The entire design is created on Whisper White Thick card stock which is adhered to the card base. Use the Hostess code (during October) on the right side bar and you could receive additional products through the Hostess Rewards scheme. Your products will be delivered via parcel post, direct to your address. It is fun to think of lots of other ways you could use this layout with different punches and coloured Washi, so why not give it a try?